A ROCK AND A HARD PLACE You wouldn’t want to get caught between these two chrome domes in Lin’s latest entry in the action franchise. If you’re like me and couldn’t recognize a Ford GT40 or a Nissan Skyline if your life depended on it, you’ve still been following the Fast and Furious series for its bold innovations in sequel titling. Retro B-movie title The Fast and the Furious (2001) was followed by the funky 2 Fast 2 Furious, the clunky The Fast and the Furious: Toyko Drift, and a fourth film lazily called Fast & Furious, destined to merge with the first in every alphabetical database. 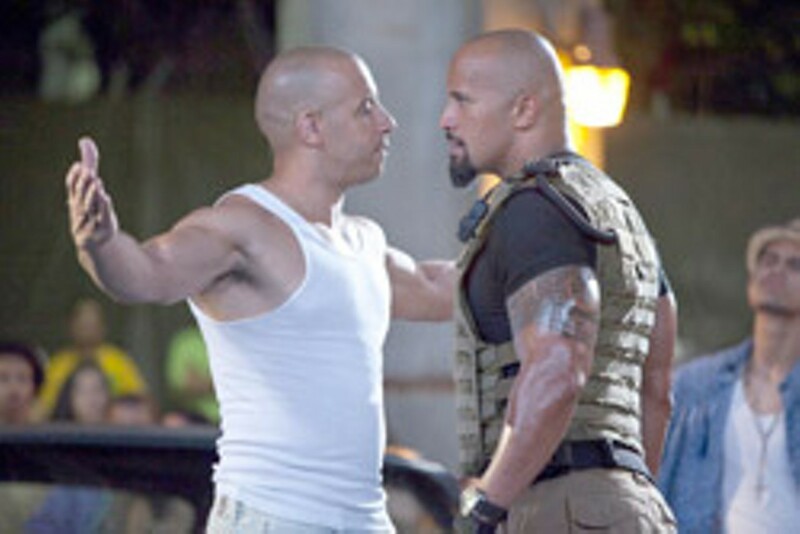 What matters is that Fast Five will satisfy any jones you may have for a good, old-fashioned stupid action movie. Remember that shot from the trailer of a car soaring into an abyss with the film’s two protagonists extricating themselves in midair? That drive-in moment so audacious it made you laugh? The whole movie is like that. Fast Five is what last summer’s The A-Team should have been. Oh, and it has two guys with necks like tree trunks — Diesel and Dwayne Johnson, the actor formerly known as the Rock — hitting each other. If you go for that sort of thing. With such direct appeal to its core audience, Fast Five doesn’t need a plot, but writer Chris Morgan supplies a fairly elaborate one. Johnson plays a federal agent hunting Diesel, a thief who’s broken out of prison with the help of his sister (Jordana Brewster) and his former FBI man best bud (Paul Walker). The trio flees to Rio, where, like so many movie criminals before them, they decide to pull off One Last Job. The target is a drug lord (Joaquim de Almeida) who keeps the poverty-ridden favelas under his thumb. To steal his stash, Diesel assembles a colorful team of characters from the three preceding movies, including Chris “Ludacris” Bridges as a gadget master, Sung Kang as a smooth talker and Israeli model Gal Gadot as a gunwoman. She volunteers her posterior when the villain’s handprint is needed to break a biometric seal — just one of the many outlandish setups this heist entails. All that distinguishes Fast Five from this year’s crop of crappy action films is a modicum of craft, cleverness and restraint. The script doesn’t wink at the audience too frenetically, and the actors deliver their lines straight. When Johnson cautions his subordinates that they should “never, ever, ever let [Diesel and Walker] get in cars,” he’s as solemn as someone in a zombie film explaining how to stay alive. As for the action, director Justin Lin (who did the two preceding films) balances shaky, tight shots that convey the thrill of speed with wide ones that establish who’s about to slam into whom from where. That may not sound like much, but without the hashed-to-bits Michael Bay treatment, scenes such as the theft of several vehicles from a speeding train are as exhilarating as they should be. 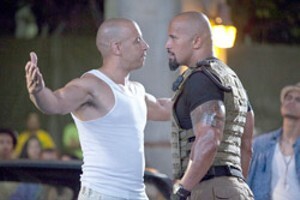 As sequel titles go, Fast Five makes more sense than its predecessors. What defies any reasonable expectation is that F & F No. 5 is the one worth seeing.